What help is available to achieve a healthy diet? A healthy diet means eating lots of fruit, vegetables and starchy foods (like potatoes, bread, rice and pasta) and some protein (like beans, pulses, fish, eggs and meat) and dairy foods (or dairy alternatives). It also means drinking enough fluid to stay hydrated and cutting down on the amount of fat, salt and sugar we consume. 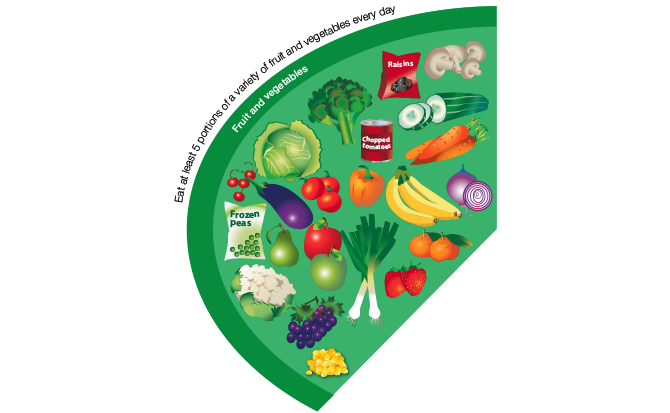 Be familiar with the food groups of the Eatwell Guide and how they relate to a healthy diet. Know the key evidence based healthy eating messages and be able to explain these through the use of the Eatwell Guide. 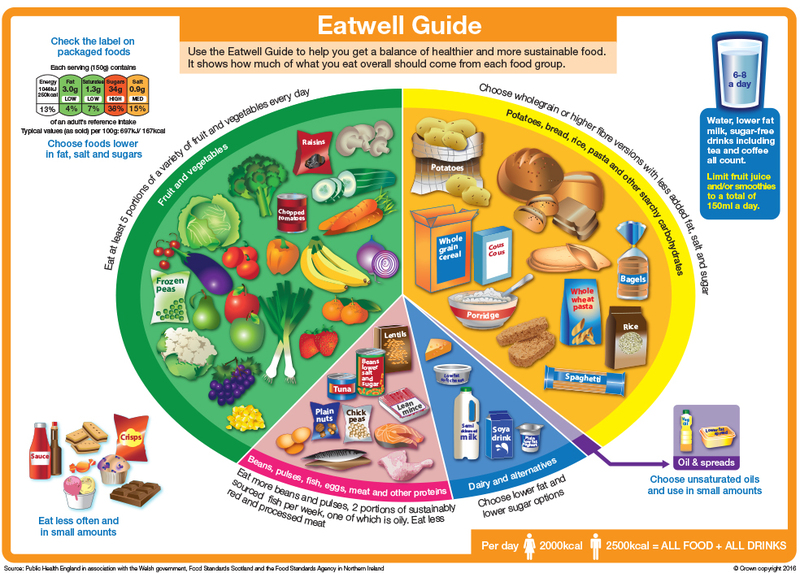 The Eatwell Guide illustrates the balance of a healthy diet. It was developed by experts and is based on scientific evidence. The Eatwell Guide divides food into five main food groups and it applies to most people over the age of two, whatever their weight, ethnic origin or whether or not they are vegetarian. We all need different amounts of energy (or calories) from food to be a healthy weight. The average female needs around 2,000 calories each day, while an average male needs around 2,500 calories. Small children need fewer calories than this – for example, an average 4 year old might only need around 1,400 calories each day. The aim is to get the balance right over a period of time, such as a day or a week. Aim for at least 5 portions of a variety of fruit and vegetables each day. Fresh, frozen and tinned fruits and vegetables (80g) all count towards five a day. Fruits and vegetables contain important vitamins, minerals and fibre. Vitamins and minerals prevent deficiency diseases and fibre can help lower cholesterol, improve bowel health and aid digestion. Fruits and vegetables are low in fat and add bulk to the meal without adding too many calories. Potatoes, bread, rice, pasta and other starchy carbohydrates are an important part of a healthy diet and should make up just over a third of the food we eat. These foods contain carbohydrates which provide energy (calories) to carry out every day activities and they also provide vitamins and minerals essential for health. Wholegrain food contains more fibre than white or refined starchy food, and often more of other nutrients so choose higher-fibre, wholegrain varieties where possible. Gram for gram starchy carbohydrates contain less than half the energy (calories) of fat. 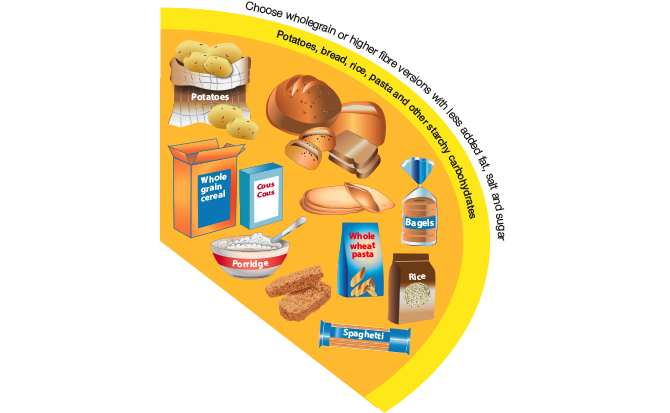 However, many processed starchy food products can be high in fats and sugar, so check the food labels for healthier options and minimise the addition of sources of fats and sugars, like butter or jam, when preparing them at home. Dairy and alternatives are good sources of protein and vitamins, and they're also an important source of calcium. Calcium is important for healthy bones and teeth. Some milk and dairy foods can be high in fat, saturated fat and sugar but there are plenty of low fat and sugar options to choose from. 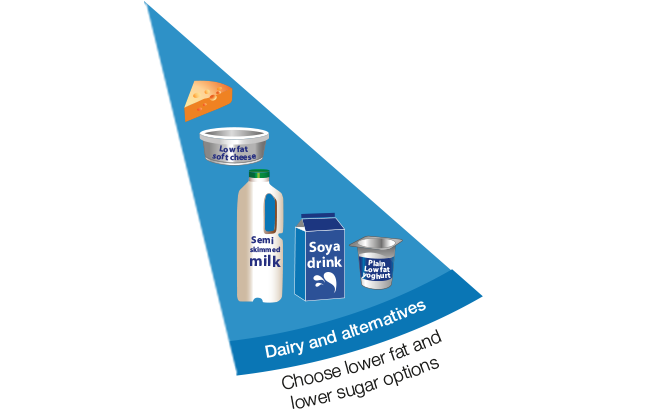 Try to include some milk and dairy food (or dairy alternatives), such as cheese, yoghurt and fromage frais and lower sugar products where possible, or have a smaller amount of the full fat/sugar varieties less often. Some people cannot eat dairy foods, however there are plenty of dairy alternatives available to buy including soya milks and yoghurts. Choose dairy alternatives which have added calcium and check the labels for lower fat and sugar options. There are many different sources of protein in a healthy balanced diet, and these sources can also provide important vitamins, minerals and fibre. Some foods from this group should be eaten every day. 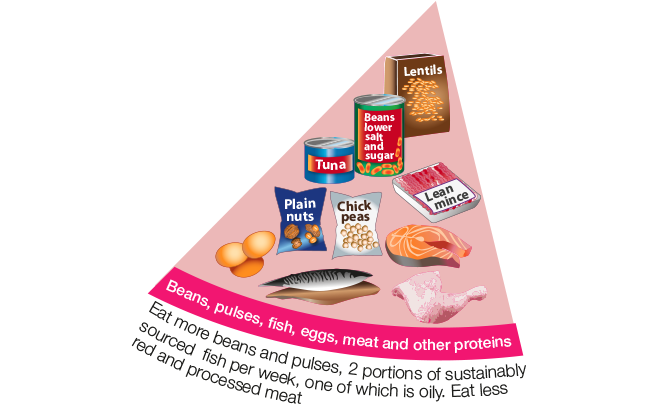 Beans, peas and lentils (types of pulses) are naturally low in fat, high in fibre, protein, vitamins and minerals. Other vegetable based sources of protein include tofu, bean curd and mycoprotein. Aim for at least two portions of fish a week, including 1 portion of oil-rich fish. Oil-rich fish e.g. salmon, mackerel and herring contain important unsaturated omega 3 fats that protect against heart disease. Red and processed meats are good sources of protein and other nutrients. However, eating lots of red and processed meat such as beef, lamb, pork and meat products like, sausages and ham increases the risk of bowel cancer. Adults should eat no more than 70g a day, which is the same as around 2 slices of roast meat. Some meats can also be high in fat and saturated fats, but there are plenty of leaner cuts and meat substitutes to choose from e.g. skinless chicken, turkey and extra lean mince. Although some fat in the diet is essential, we are generally eating too much and need to reduce our consumption. Unsaturated liquid oils and unsaturated spreads are healthier than saturated fats. 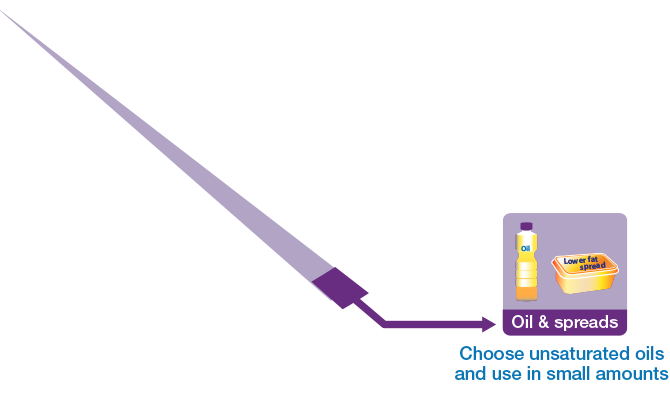 For example vegetable oil, rapeseed oil and olive oil are higher in unsaturated fats. They help to reduce cholesterol and so it is important to get most of our fat from unsaturated sources. All types of fat (saturated and unsaturated) are high in calories and therefore should only be consumed in small amounts. Discretionary products such as chocolate, cakes, savoury snacks, biscuits, sugary drinks and ice-cream are not needed as part of a healthy diet. Therefore they should only be eaten occasionally and in small amounts. They contribute unnecessary calories and can contribute to weight gain. Eating too many sugary foods and drinks can cause tooth decay, and drinking lots of sugary drinks increases the risk of developing type 2 diabetes. Check the label (covered in Module 3) and avoid foods which are high in fat, salt and sugar! The body constantly loses fluid through breathing, sweating or going to the toilet and therefore this needs to be replaced. Aim to drink 6-8 glasses of fluid each day to help keep the body hydrated. Water, lower fat milk and sugar free drinks, including tea and coffee all count. Choose sugar free options instead of sugary drinks. Limit consumption of fruit juices and smoothies to no more than a combined total of 150ml per day, because they are high in sugar. Alcohol contains lots of calories, however the amount of calories an alcoholic drink contains depends on the type of alcohol, the amount served and what mixers are added. As an example, 1 pint of lager or a 175ml glass of wine contains around 135 calories while a 25ml shot of spirit contains around 56 calories. To minimise the health risks associated with drinking alcohol, consumption should be limited to no more than 14 units per week for men and women. One unit is the same as one small single measure of spirits, while a 175ml glass of wine or a pint of standard strength lager or cider contains 2 units. Only a very small amount of salt is needed in the diet. Most people eat too much salt and would benefit from cutting down. Around three quarters of the salt in the Scottish diet comes from processed foods like bread, meat products, biscuits and ready meals. Eating too much salt can raise blood pressure which can lead to stroke or heart disease. eating discretionary foods and drinks less often and in smaller amounts. Check product labels to help you choose lower salt varieties. Eating too much salt can cause high blood pressure, which can lead to stroke or heart disease. Most of the salt in the Scottish diet comes from processed foods. A maximum of 6g of salt per day is recommended for adults. Children’s diets should contain less. Answer the questions below to see what you've learned and to complete module 2. A small glass (150ml) of fruit juice counts towards 1 of the 5 portions of fruit and vegetables. A large glass of orange juice (300ml) counts towards 2 of the 5 portions of fruit and vegetables. A large glass of orange juice (300ml) counts towards 1 of the 5 portions of fruit and vegetables. Pick the best source of fibre. Which statement is false about dairy and alternatives? It is recommended that some dairy and alternatives should be included in the diet regardless of their fat and sugar content. We should include some dairy and alternatives in our diet. Dairy and alternatives are good sources of protein and calcium. Some meats can be high in fat and saturated fat. Why is it important to reduce the consumption of food and drink high in fat, salt or sugar? They tend to be high in calories. They often take the place of healthier options such as fruit and bread. Most people need less than 6g of salt a day. Adults need 6g of salt a day. Children should have less than adults. Adults should have no more than 6g of salt a day. You completed Module 2 – complete all modules to progress. An email is on its way to you! Didn’t receive your email? Try entering your email address again.